New Zealand (Māori: Aotearoa [aɔˈtɛaɾɔa]) is a sovereign island kintra in the soothwastren Paceefic Ocean. The kintra geografically comprises twa main landmasses—the North Island (Te Ika-a-Māui), an the Sooth Island (Te Waipounamu)—an aroond 600 smawer islands. New Zealand is situatit some 1,500 kilometres (900 mi) east o Australie athort the Tasman Sea an reuchly 1,000 kilometres (600 mi) sooth o the Paceefic island auries o New Caledon, Fiji, an Tonga. Acause o its remoteness, it wis ane o the last launds tae be settled bi humans. In its lang period o isolation, New Zealand developit a distinct biodiversity o ainimal, fungal, an plant life. The kintra's varied topografie an its shairp moontain peaks, such as the Soothren Alps, awe muckle tae the tectonic uplift o laund an volcanic eruptions. New Zealand's caipital ceety is Wellington, while its maist populous ceety is Auckland. Sometime atween 1250 an 1300, Polynesies settled in the islands that later war named New Zealand an developit a distinctive Māori cultur. In 1642, Dutch explorer Abel Tasman becam the first European tae sicht New Zealand. In 1840, representatives o the Unitit Kinrick an Māori chiefs signed the Treaty o Waitangi, that declared Breetish sovereignty ower the islands. In 1841, New Zealand becam a colony within the Breetish Empire an in 1907 it becam a Domeenion; it gained full unthirldom in 1947, but the Breetish monarch remeened the heid o state. The day, the majority o New Zealand's population o 4.7 million is o European strynd; the indigenous Māori are the lairgest minority, follaed bi Asies an Paceefic Islanders. Reflectin this, New Zealand's cultur is mainly derived frae Māori an early Breetish settlers, wi recent braidenin arisin frae increased immigration. The offeecial leids are Inglis, Māori an NZ Sign Leid, wi Inglis bein verra dominant. New Zealand is a developit kintra an ranks heichly in internaitional comparisons o naitional performance, sic as quality o life, heal, eddication, an economic freedom. The kintra unnerwent major economic chynges in the 1980s, that transformed it frae a pertectionist tae a leeberalised free-tred economy. The service sector dominates the naitional economy, follaed bi the industrial sector, an agricultur. Internaitional tourism is a signeeficant soorce o revenue. Naitionally, legislative authority is vestit in an elected, unicameral Pairlament, while executive poleetical pouer is exercised bi the Cabinet, led bi the Prime Meenister, that is currently Jacinda Ardern. Queen Elizabeth II is the kintra's heid o state an is representit bi a govrenor-general, currently Dame Patsy Reddy. In addeetion, New Zealand is organised intae 11 regional cooncils an 67 territorial authorities for local govrenment purposes. 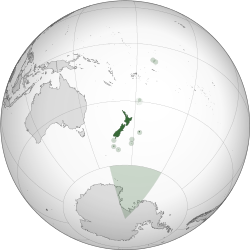 The Realm o New Zealand an aw includes Tokelau (a dependent territory); the Cook Islands an Niue (sel-govrenin states in free association wi New Zealand); an the Ross Dependency, that is New Zealand's territorial claim in Antarcticae. New Zealand is a member o the Unitit Naitions, Commonweel o Naitions, ANZUS, Organisation for Economic Co-operation an Development, ASEAN Plus mechanism, Asie-Paceefic Economic Cooperation, an the Pacific Islands Forum. ↑ "Estimated resident population of New Zealand". Statistics New Zealand. 30 January 2014. Retrieved 30 January 2014. ↑ "Number of Electorates and Electoral Populations: 2013 Census – Media Release". 2013 Census. Statistics New Zealand. Retrieved 7 October 2013. ↑ 4.0 4.1 4.2 4.3 "New Zealand". International Monetary Fund. Retrieved 20 April 2012. ↑ "Human Development Report 2013" (PDF). United Nations. p. 16. Retrieved 5 May 2013. Wikimedia Commons haes media relatit tae New Zealand. This page wis last eeditit on 21 August 2018, at 01:13.